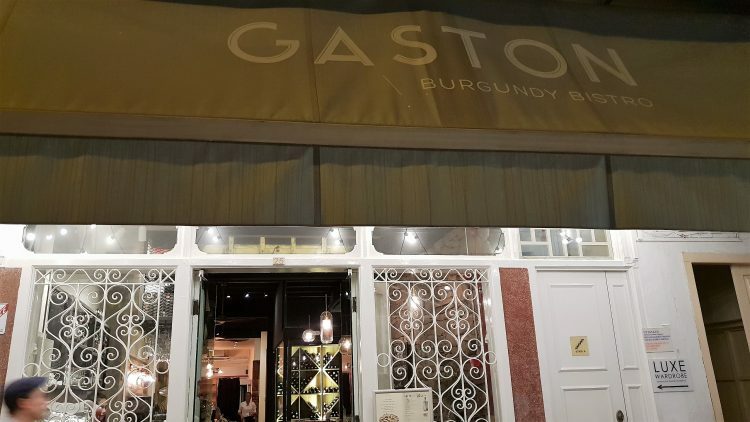 Gaston bills itself as a “burgundy bistro”. 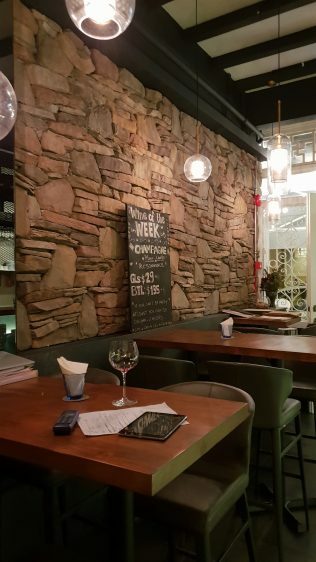 Quite clearly the focus is on its extensive range of wines from Bourgogne. So much so that even Burgundy novices can kickstart their road to the famed pinot-growing terroirs because you can find some good wines that do not cost the usual bomb that Burgundies cost. For example, you can start with a 2014 Domaine Goichot for $75. More reasonable than the entry-level stuff I end up paying for at most other restaurants at that price level. 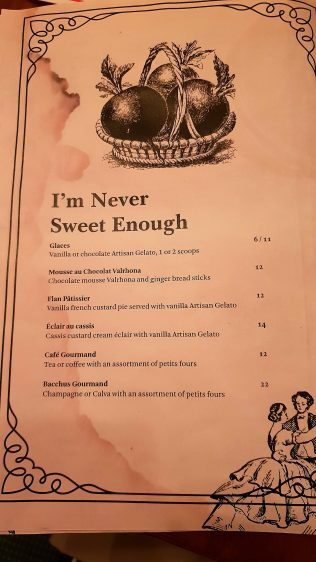 True, the wine list at Gaston isn’t filled with the Burgundian bigwigs, but I’m guessing their focus on the smaller appellations is one reason why they can also offer more attractive prices to their guests. There are over 200 labels of wines across the world, with a hefty percentage of Burgundies, including more than its fair share of the beautiful white Burgundy. 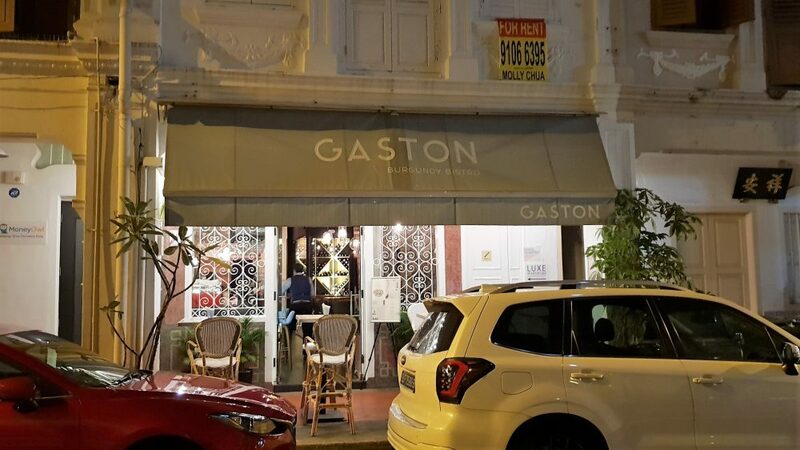 But there’s more to Gaston than le vin. 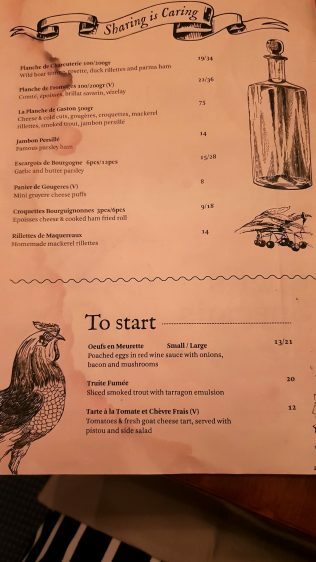 Although limited, the food menu is sufficient enough for a nice night out, especially if you and your friends are oenophiles. 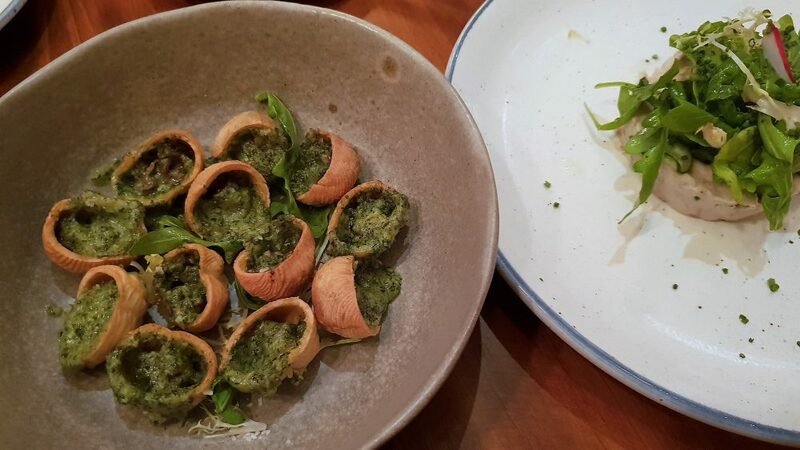 The typical Burgundian snails, the Escargots ($28 for 12 pieces), are presented in a rather charming manner here. Instead of the usual inedible shell, these come is a crisp pastry shell, which if one didn’t know any better, might have just ended up not eating. 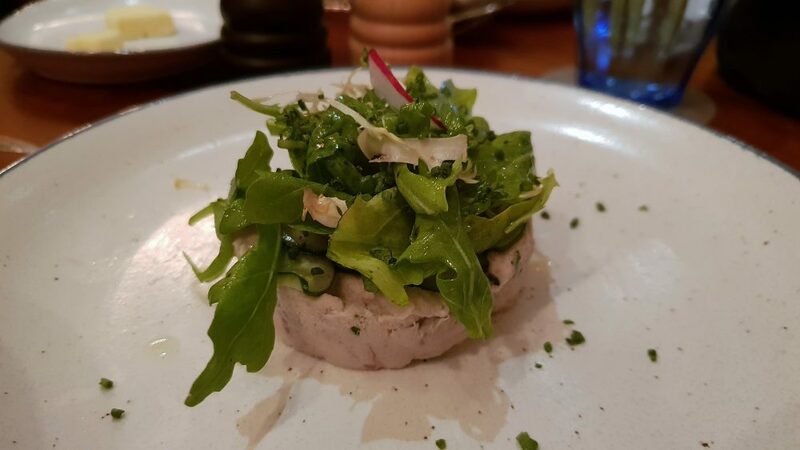 Instead of a duck rillette, Gaston serves a Mackerel Rillette ($14). It had a good acidity through it, but texture-wise, tad bit too much like a paste, too smooth. Went well with the bread served, of course. 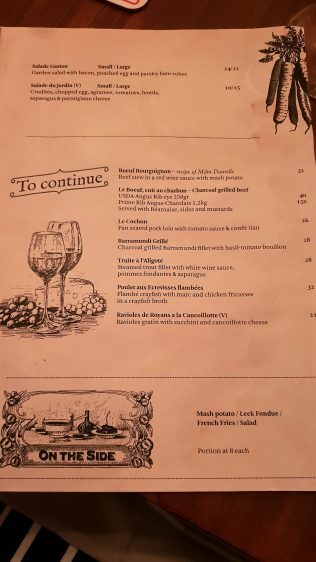 Another Burgundian staple, the Boeuf Bourguignon ($32) is also available, but I had been eating way too much red meat, so chose the Barramundi ($28) instead. 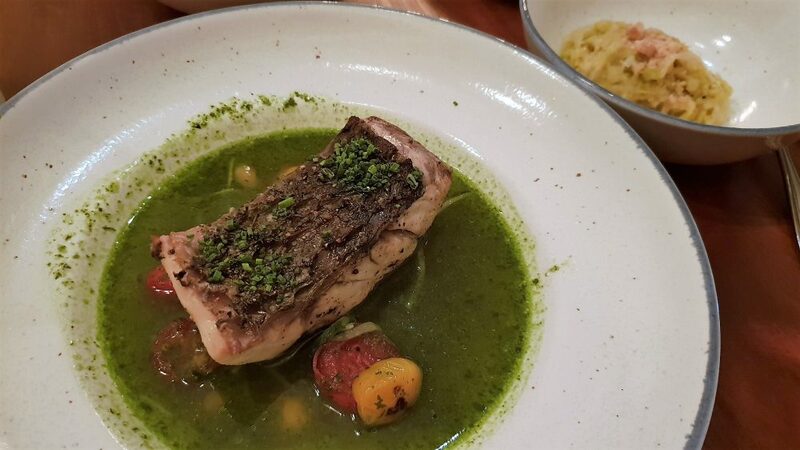 The fish was perfectly cooked, very flaky just the way I like my fish, and it came swimming in a tomato and basil bouillon. Some might find it slightly under-salted but for me, it was ok. I prefer the naturally healthy, tasty flavours of the tomato and basil to uplift the grilled fish. 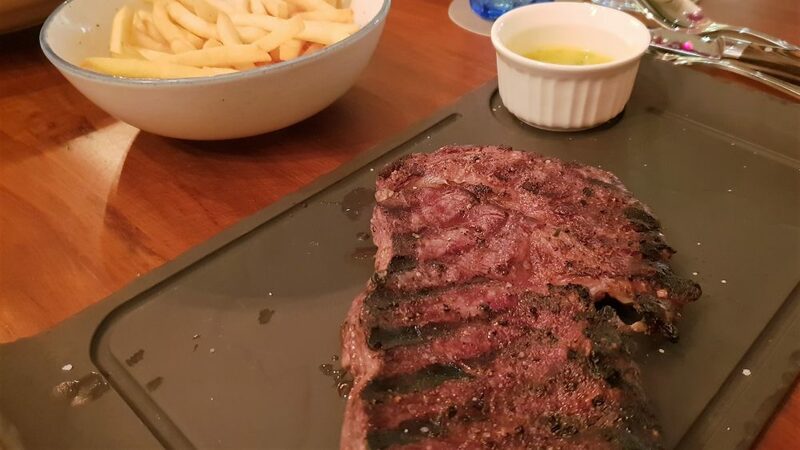 As for the Charcoal-grilled Beef ($40), that didn’t suffer from any lack of taste. It was a rib-eye so you know, fat-averse moi wouldn’t have relished it, but my friends seem to have enjoyed it. 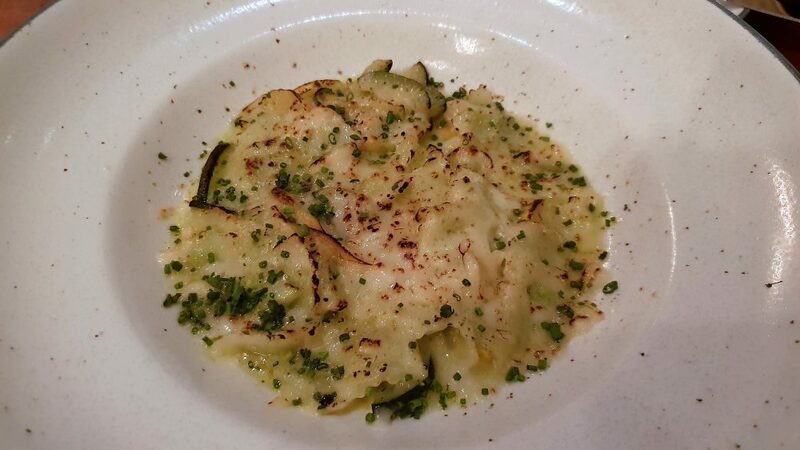 Vegetarians should enjoy the Ravioles Gratin ($21) which comprises zucchini and cancoillotte cheese. Just the right portion size so you can savour every bite of creamy goodness. My highlight of the meal at Gaston was my Chocolate Mousse ($12). Not only was the mousse simply lovely, with a little tinge of smokiness (I’m not sure why, but I liked it! 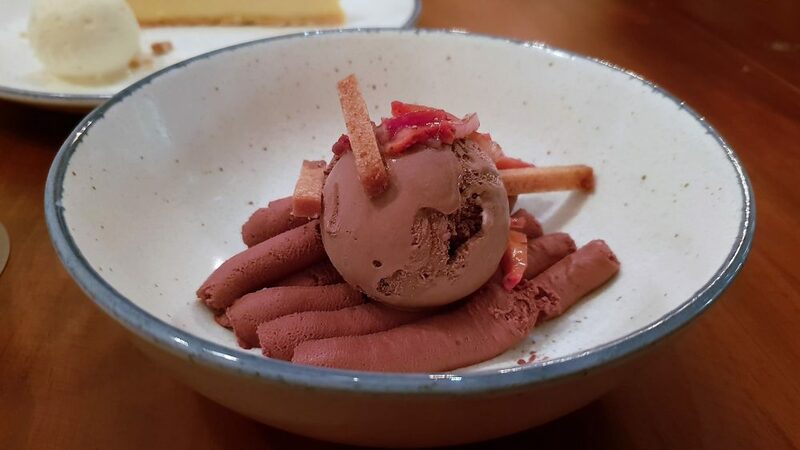 ), the dessert came with a rich, dark chocolate ice cream. Yum. 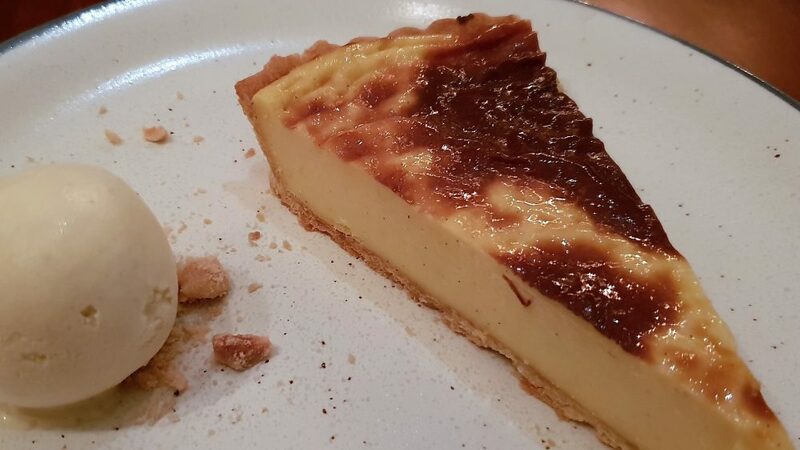 Hubby had the Flan Patissier ($12), a French vanilla custard pie. Also, delicious but I felt I was the winner with my mousse . Service is friendly, the French manager is very charming and smiley, surprise surprise, so he’s not from Paris, I’m guessing? Je rigole! I’m kidding! Well, I would go back to Gaston especially if any wine-lover wanted to accompany me, as I would love to try some of the other labels. Food-wise, they’d probably need to add more variety in the future so as to keep regulars intrigued. Nothing makes the future look so rosy as to contemplate it through a glass of Chambertin – Napolean Bonaparte. Well said, Bon Bon, well said.